Every 4 years in the United States, someone enters the race for president who has no affiliation, party or national support. Deez Nuts 2016 is now polling higher than some Republican and Democratic rivals thanks in part to a new t-shirt campaign launched yesterday. In an effort to gain more support, the Deez Nuts candidate has broken his silence in the national media. A new shirt has been launched to help support this up-and-coming candidate. 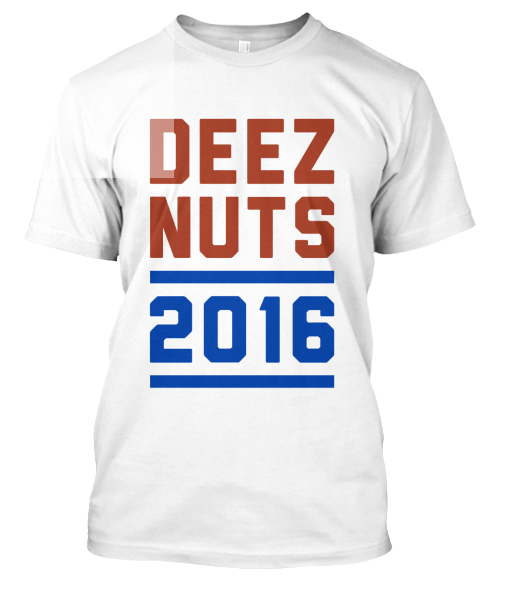 The shirt is sale priced to help keep costs down for consumers who will support the 2016 Deez Nuts campaign. The publicity that is expected for the campaign should bring more awareness to the newly designed t-shirt. While there is no official campaign shirt, supports like those on this website are helping to promote the 2016 efforts of Deez Nuts during the 2016 election cycle. More shirts and merchandise are expected to be released as support grows nationally.